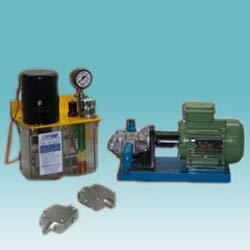 Our range of products include centralized oil lubrication system. These Are Used in Machinery Wherein, the Oil is Used by the Parts and the Oil Collected and Re Circulated Using a Pump. the Common Type of Application Are the Enclosed Gear Boxes, However, for Gears Which Are Not Enclosed Spraying of Oil is Desired. There Are Types of Systems Which Require Many Parts to Be Lubricated Continuously, Here Use of Progressive Distributors Are Used to Ensure That All Parts of the Machine Get the Lubricant in Equal Amount. Majority of Machines Require Small Doses of Oil to Various Parts of the Machine. in This System a Small Power Pack Called the Lubricating Pump Which Runs on Electric Supply/Manual or Pneumatic Drive is Used. Here, the Use of Metering Cartridges (Sometimes Called ‘injectors’) Allows a Maximum No of Points to Be Lubricated in a Very Small Systematic Manner, So That Lubrication is Achieved Regularly in Small Quantities and with Better Frequency, Thereby Optimum Usage of Lubricant is Achieved, Thus No Spillage of Oils, and the Frequent Lubrication Ensures Better Life Than Conventional Manual Lubrication. We Have Developed Injectors/Metering Cartridges Which Not Only Perform Better, but Also Indicate when the Injectors Are in Operation, Without the Removal of Pipes and Cumbersome Methods. Unlike Other Injectors Our Metering Cartridges Are Made Such That the Flow of Each Injector Can Be Controlled and a Range Upto 0.4 Cc Can Be Achieved on Single Point Thereby Adjusting the Flow as Per the Requirement is Possible. Looking for Centralised Oil Lubrication System ?